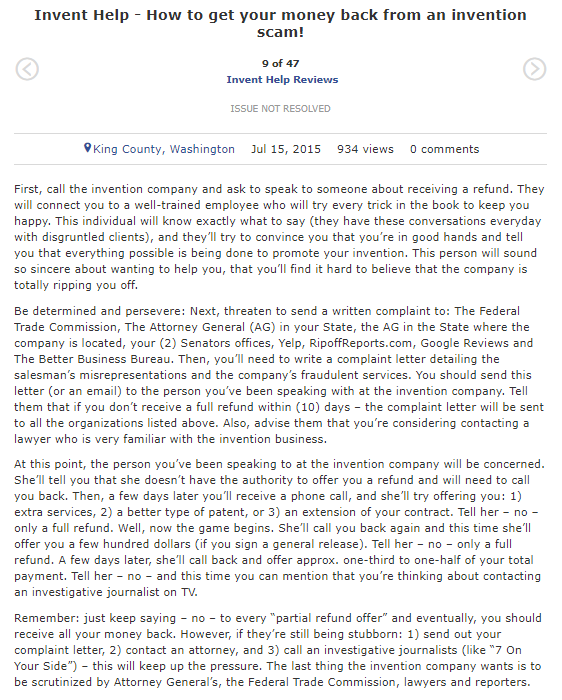 Why Did This Florida Takedown Lawyer Try to Suppress Negative Reviews for InventHelp? 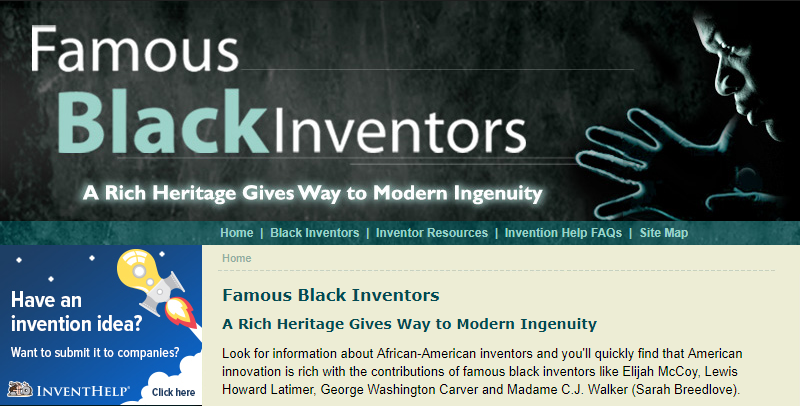 InventHelp is a Pittsburgh, Pennsylvania-based company that claims to help aspiring inventors patent and market their inventions. From its inception in 1984, InventHelp has cultivated a slick image. For example, since 2014 legendary former boxer turned small appliance pitchman George Foreman has been spokesman for the company, appearing in upbeat, “you can do it” promotional videos. Despite that image, in recent years InventHelp has faced allegations of fraud. In April 2016, someone named Zachary Sloan—who according to ZacharySloan.com appears to be a defamation lawyer in Boca Raton, Florida—sent Google four identical de-indexing requests targeting InventHelp’s profile on PissedConsumer.com, an online forum that allows consumers to write reviews of companies. (Sloan previously represented online reputation management company Profile Defenders, which is currently facing scrutiny for allegedly filing fraudulent lawsuits in order to get negative reviews de-indexed from Google’s search results). 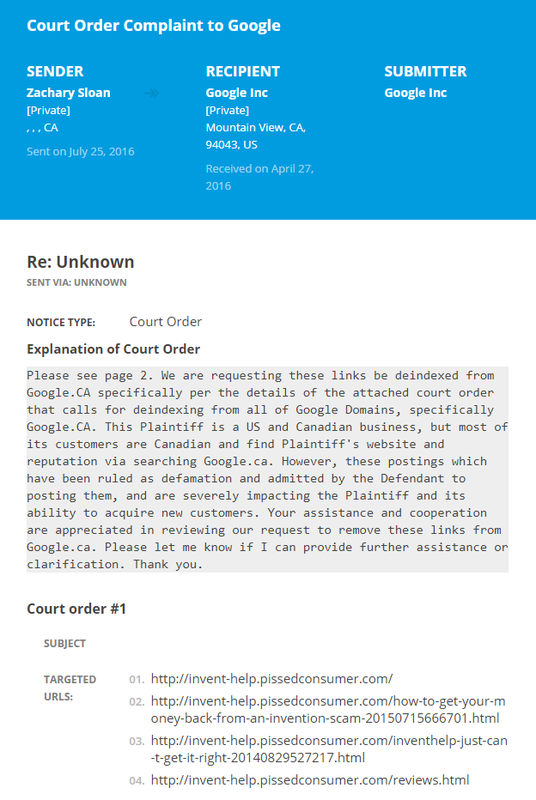 Citing a court order he claimed he’d obtained from an unidentified court in Canada, Sloan requested that Google de-index four PissedConsumer.com pages from its search results, including the above review, which Sloan claimed contained defamatory information about InventHelp. It’s unclear if Google capitulated to his de-indexing request, and multiple attempts to contact Sloan went unanswered. However, it appears that InventHelp, or someone working on behalf of InventHelp, did succeed in obscuring the Pissed Consumer reviews. 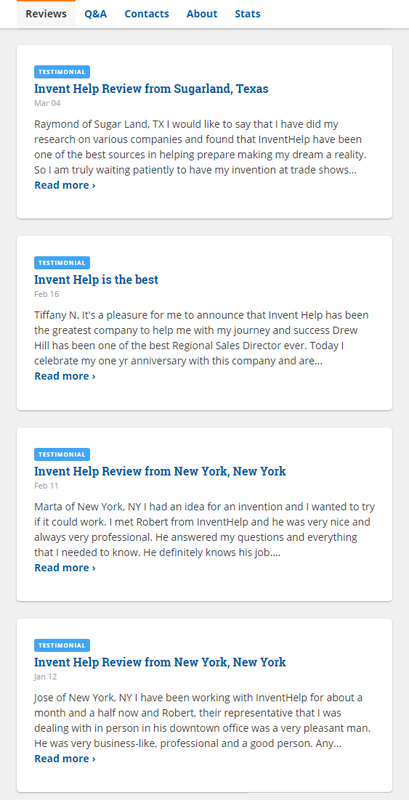 Now when consumers try to access InventHelp’s profile at Invent-Help.PissedConsumer.com, instead of being directed to a page of negative reviews and accusations of fraud, they’re quickly redirected to a second, privately registered domain, InventHelp.reviews, where they’re shown a page of glowing testimonials. Although the negative reviews are still available to view via that second domain, most have been moved to the back of the website, while many others, including the anonymous review quoted above, are only available to view by clicking a drop-down option below InventHelp’s own, more prominently positioned replies to the reviews. 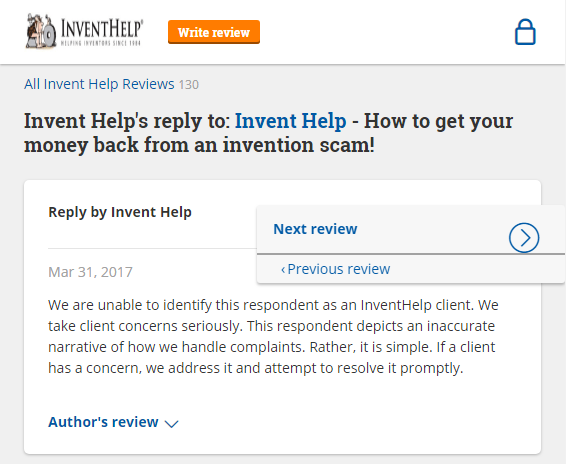 InventHelp and Pissed Consumer did not reply to requests for comment. However, Pissed Consumer’s page of Frequently Asked Questions states that the website will remove reviews upon receiving a U.S. court order. The website also provides a dispute resolution service.